New Family friendly prices! 1/2 off Gen admission for 11-21 years of age! Check out the New Student Prices on the Ticket Purchase Page! 2019 is a year not to miss! Talented bands from Florida to the great state of Michigan, from Ohio to Illinois will resonate through the trees of Winding Creek! 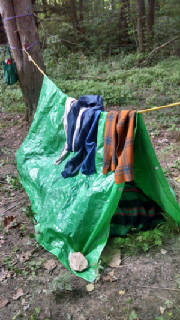 Camping is Free, bring your RV or Tent and join us! Duane and Bob are happy to announce the bands for 2019 and really appreciate all who attended in 2018. Thank you for your support! The fun starts on Thursday! 3 bands will be playing Thursday night, followed with a jam at the Log Cabin! 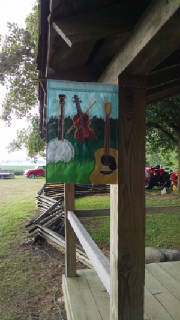 Bring your instruments and join us at the Log Cabin! Share the Winding Creek Facebook page with your friends. 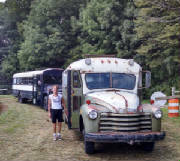 If you came last year please write a short note on your favorite part of Winding Creek. Click here for Winding Creek Facebook! 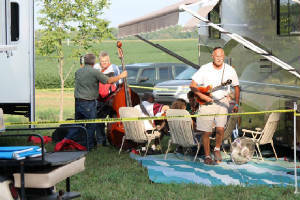 Jam & Pick at your campsite, cabin, blacksmith shop or small stage that over looks the valley! Pets are allowed if your are camping! "See pet rules on camping page"
2019 Lineup! 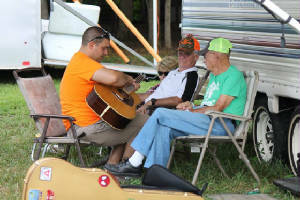 Trinity River Band Red Tail Ring Edgar Loudermilk Band Branded Bluegrass FireBox Cornfields & CrossRoads Bahler Golden Age Band New Outlook Blue Holler Band Alec Hurtubise & Friends Cumberland Gap Kokomo Cowboy Church Band . Join us and be part of the Winding Creek family. Please introduce yourself to Bob & Duane, they would love to meet you. Check out the bands below for more info about them! Shade is no stranger at Winding Creek! Check schedule page for bands playing times! Pick each bands picture to visit their website. Winding Creek is located 50 miles north of Indianapolis and 10 miles west of Kokomo, Indiana. "Go to the map page for the convenient route planner." Click on picture for band's website.  From the sunny state of Florida, with influences drawn from almost every type of music! 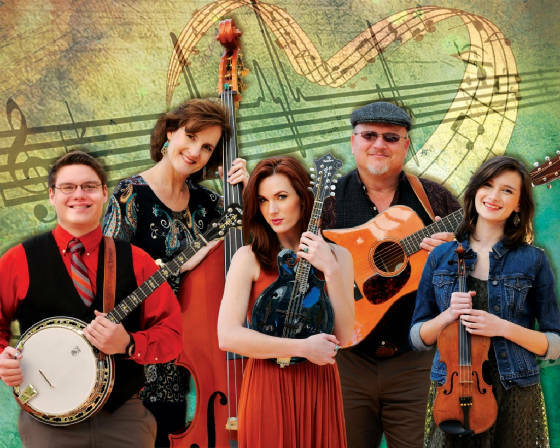 The Trinity River Band masterfully mixes the water of broad-flowing genres (such as: Americana, Rock, Celtic, Christian, Folk & Country) into a dazzling serene lake of musical genius! Come and listen to the Trinity River Band in their raw, creative, boundless, unbias and honest musical form! FireBox hales from Effingham, Illinois. 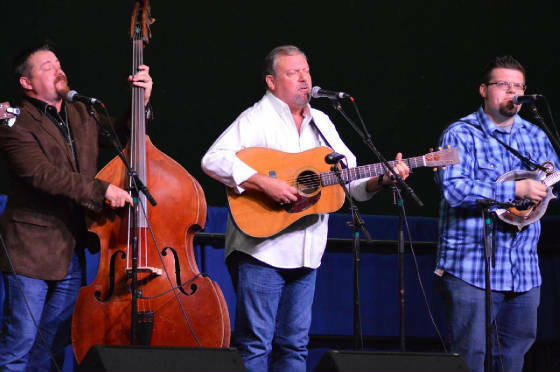 In August they appeared on RFD-TV (The Bluegrass Trail Show). 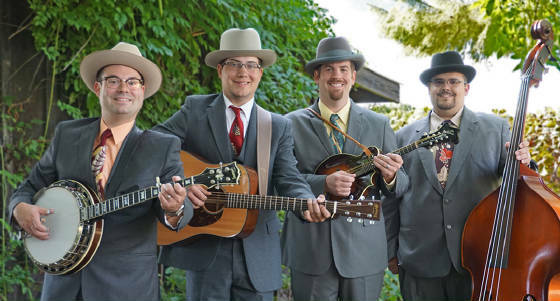 If you are looking for a traditional bluegrass this is the band! Click on their picture to learn more about FireBox! better yet come on Saturday to hear them first hand! Branded Bluegrass have been making great strides! Winding Creek is honored to call them our hometown band and friends! Their new CD "Most Welcome" is a huge success! 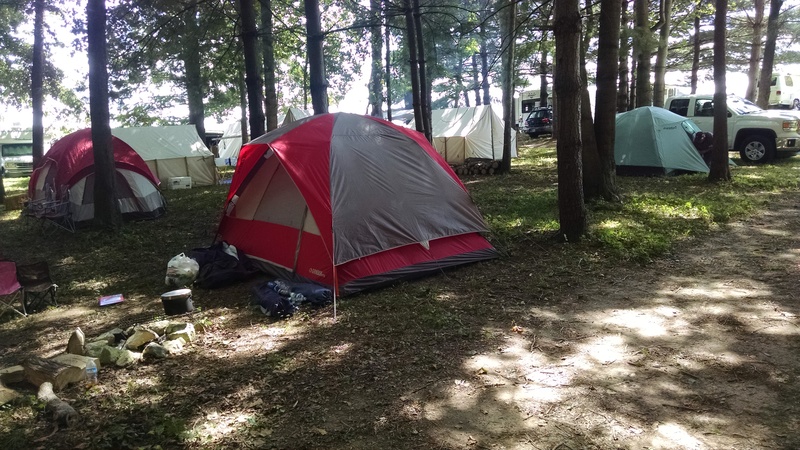 With their booking increase, Duane & Bob are glad they have kept Winding Creek weekend open. Come out and give your ears some great pleasure on Friday and Saturday as they grace the stage! We are exited to have Red Tail Ring at Winding Creek! Michael & Luarel are based out of Traverse City, Michigan and have played at the Fiddler's Gathering located near Lafayette Indiana. This duo comes highly recommended and will definately appeal to the young & older generation! 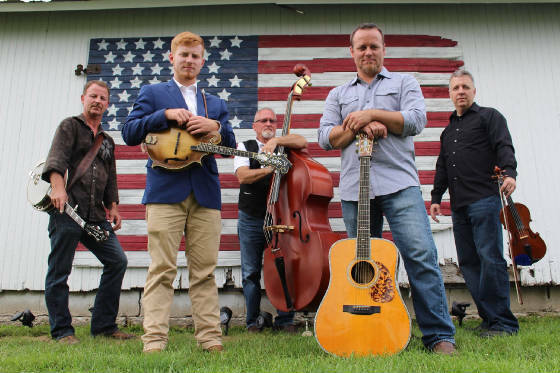 They have been featured on Bluegrass Junction for their folk & bluegrass sound. 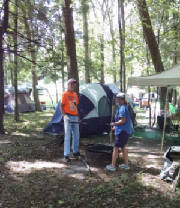 Bring your Tent or RV and settle in for the weekend and listen to this lively duo! On the trail on the highly successful A&L album, Edgar has struck out on his own with a solo project that he is very excited about. He is working with a new band called Edgar Loudermilk Band, featuring Jeff Autry. Although the band name may be new, all of the members have played together for quite some time and have super chemistry and stage dynamics. Edgar's former A&L bandmates, Jeff Autry (featured guitar player), Glen Crain (dobro) and Zack Autry (mandolin), complete his current band. 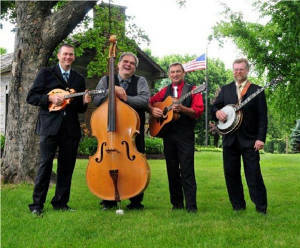 They have recorded Edgar's album, titled "Georgia Maple" along with banjo picker, Chris Wade and have been booked solid all over the United States and Canada. Click on cabin picture to visit the KohKohMah website which is a living history event taking place the 3rd weekend of September on the same grounds. "Jam/Pick with Friends and make New Friends"
New Outlook band calls Ohio home. 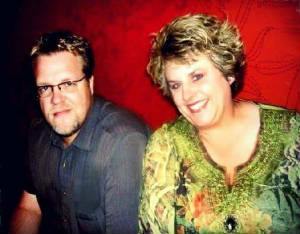 Lori & Brad Lambert team up with their band and always brings a strong sound to the stage! Lori has been impressing folks with her upright bass playing and powerful lead and harmonies for years. 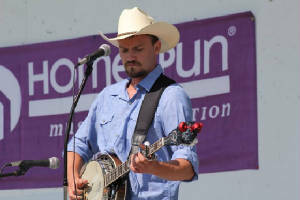 Brad brings to the group his own style of soul stirring and hard driving banjo pickin. Brad is a well round musican who can pick up about any instrument and put it to the test! They will also have their music store on hand at Winding Creek for your musical needs! Duane and Bob are certainly glad to have New Outlook join us in 2019. Duane & Bob really enjoy this band! Bob says Mark has the golden voice and of course Mark's mother agrees! We're glad to have this Indiana band back for 2018! Click on picture for Band's face book page. Hailing from the rural farmland near Bennetts Switch, Indiana, north of Kokomo. 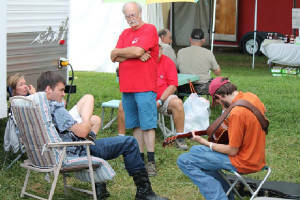 The Bahler Family Band plays yearly at the Indiana Fiddlers' Gathering at Battleground, just north of Lafayette, which takes place in June. 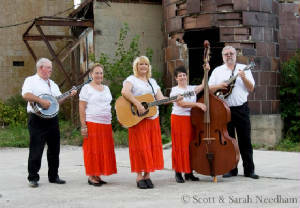 Winding Creek is honored to have their enjoyable string and voice harmony. Alec loves bluegrass music and has dedicated much time to learning songs from the past by Ralph Stanley and Bill Monroe. Click on Alec's picture above and watch a short video from 2012 on how his love for bluegrass got started. 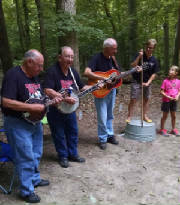 Blue Holler Band are rooted in Northern Indiana. 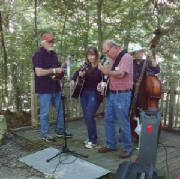 They love traditional bluegrass and if you visit Winding Creek on Thursday you will understand why! This band has talent and enjoy entertaining the crowd with great vocals and wonderful musicians! Cumberland Gap is planted firmly in the Muncie, Indiana area. Duane and Bob appreciate the folks who make up this band. They will bring their talent to Winding Creek on Sunday following the church service! You may hear the Orange Blossoom Special and are guaranteed to engage in some toe tapping music! 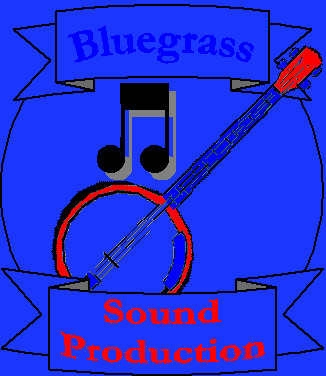 Winding Creek's great sounds come from Bluegrass Sound Production. Owners Dave & Jean Yount are awesome when it comes to sound. 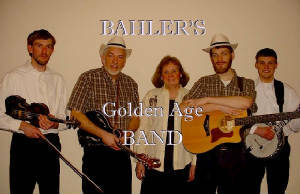 If you're looking for great sound contact them at 317-519-9351 or select the banjo for their website.